In a highly fragmented and competitive global market for optical character recognition (OCR), savvy players are leveraging a multi-pronged strategy to surge ahead of their competitors. One strategy popular with them is competitive pricing which helps to draw more consumers. Besides, they are also banking upon mergers and acquisitions and carefully-considered partnerships to expand their outreach. Addition of new services is another way in which they are looking to further enhance their market shares. Optical character recognition is a technology has literally revolutionized the document management process in various sectors, namely legal, banking, education, healthcare, finance, and government. It has helped to transform offices into a paperless ones by helping to digitize documents and communications that have remained resistant to digitization with speed and accuracy. Those include scanned paper documents and PDF files or images captured by a digital camera. Further, the advancement of optical character recognition from a special purpose reader to a multi-purpose interactive system has lowered the cost of data capturing and has paved the way for the development of more reliable systems. This will also have a positive impact on the market. As per Transparency Market Research, the global optical character recognition market will likely become worth US$25.182 bn by 2025-end by clocking a solid 14.8% CAGR from 2017 to 2025. The global optical character recognition market can be classified into two based on type – software and service. The software segment further includes desktop based OCR, mobile based OCR, cloud based OCR, and others such as batch OCR, server based OCR, etc. The service segment, on the other hand, includes consulting, outsourcing, and implementation and integration. Between software and services, the two segments in the global optical character recognition market, software accounted for maximum share. In the years ahead too, software segment will retain its dominant share buoyed by the banking sector in particular. In terms of growth rate, however, the service segment is predicted to witness a higher CAGR in the forecast period. From a geographical standpoint, North America held maximum share in the global market for optical character recognition in 2016 because of the rapid infrastructure development and changing policies and regulations framed by the government. In the upcoming years, the region is slated to hold on to its leading position. Enterprises in the region are also opting for cloud based optical character recognition software because of its ease of use and cost effectiveness. Vis-à-vis growth rate, Asia-Pacific optical character recognition market is slated to outpace all others by registering a CAGR of 15.6% from 2017 to 2025. The growth is mainly driven by small and medium enterprises (SME) mushrooming in the region. Besides, the growing use of optical character recognition software by IT and telecom industry for document management is serving to act as a catalyst for the Asia Pacific market. Fast-expanding developing nations of China and India are at the forefront of adopting OCR in the region on account of the massive investments in technology. Some of the key players operating in the global market for optical character recognition are Anyline GmbH, ABBY Software Ltd., Adobe Systems Incorporated, ATAPY Software, CCi Intelligence Co. Ltd., Creaceed S.P.R.L., CVSION Technologies Inc., Exper-OCR Inc., Google Inc., LEAD Technologies Inc., I.R.I.S.S.A. (Canon), IBM Corporation, Microsoft Corporation, Nuance Communications Inc., NTT Data Corporation, Paradatec, Inc., Prime Recognition Corporation, Ripcord Inc., Transym Computer Services Ltd., Black Ice Software LLC, SEAL Systems, Ricoh Group, and Accusoft Corporation. The global optical character recognition market report provides analysis for the period 2015–2025, wherein the period from 2017 to 2025 is the forecast period and 2016 is the base year. The report covers all the major trends and technologies playing a key role in optical character recognition market growth over the forecast period. It also highlights the drivers, restraints, and opportunities expected to influence market’s growth during the said period. 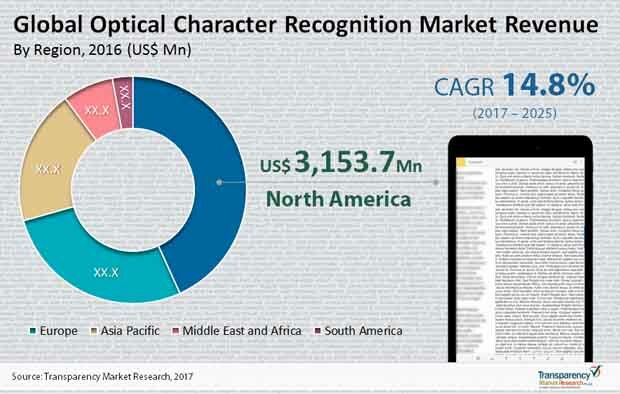 The study provides a holistic perspective on the optical character recognition market’s growth throughout the above mentioned forecast period in terms of revenue (in US$ Mn), across different geographies, including North America, Europe, Asia-Pacific, Middle East & Africa (MEA) and South America. The market overview section of the report demonstrates the market dynamics and trends, such as the drivers, restraints, and opportunities that influence the current nature and future status of this market. An attractiveness analysis has also been provided for every geographic region in the report, in order to give a thorough analysis of the overall competitive scenario of the optical character recognition market, globally. Moreover, the report provides an overview of the various strategies of key players present in the market. Introduction and market definition chapter helps in understanding different technologies of optical character recognition along with their applications which are included in the report. The report segments the global optical character recognition market on the basis of type into software and service. Thus, the report provides in-depth cross-segment analysis of the optical character recognition market and classifies it into various levels, thereby providing valuable insights at the macro as well as micro levels. Further, the optical character recognition software market is segmented into desktop based OCR, mobile based OCR, cloud based OCR and others (batch OCR, server based OCR etc.) The optical character recognition service market is classified into consulting, outsourcing and implementation & integration. Optical character recognition is also segmented on the basis of end-use into retail, government, BFSI, education, transport & logistics, healthcare, media & entertainment, IT & Telecom and manufacturing. On the basis of country, North American market is divided into The U.S., Canada and Rest of North America. Similarly, Europe market is divided into The U.K., Germany, France, Italy, Spain and Rest of Europe. Asia Pacific has been segmented into China, Japan, India and Rest of Asia Pacific. Middle East and Africa covers the GCC countries, South Africa and Rest of Middle East and Africa. Similarly, South American region includes Brazil and Rest of South America. The report also highlights the competitive landscape of the optical character recognition market, thereby positioning all the major players according to their geographic presence and recent key developments. The comprehensive optical character recognition market estimates are the result of our in-depth secondary research, primary interviews, and in-house expert panel reviews. These market estimates have been analyzed by taking into account the impact of different political, social, economic, technological, and legal factors along with the current market dynamics affecting the optical character recognition market’s growth. This report provides all the essential information required to understand the optical character recognition and its components. Furthermore, Porter’s Five Forces analysis explains the factors which are currently affecting the market. This report also provides the value chain analysis for the optical character recognition market which explains the participants of the value chain. Some of the key players engaged in OCR market include ABBY Software Ltd., Anyline GmbH, Adobe Systems Incorporated, ATAPY Software, CCi Intelligence Co. Ltd., Creaceed S.P.R.L., Captricity, CVSION Technologies Inc., Exper-OCR Inc., Google Inc., I.R.I.S.S.A. (Canon), IBM Corporation, LEAD Technologies Inc., Microsoft Corporation, Nuance Communications Inc., NTT Data Corporation, Paradatec, Inc., Prime Recognition Corporation, Ripcord Inc., Transym Computer Services Ltd., Beijing Wintone Science & Technology Co. Ltd., Black Ice Software LLC, SEAL Systems, Ricoh Group and Accusoft Corporation among others. Details such as financials, SWOT analysis, business strategies, recent developments, and other such strategic information pertaining to these players have been duly provided as part of company profiling.